So I thought I would give felting a try, and did a small project first to test the waters, and I'm glad I did, because it didn't work! 1. 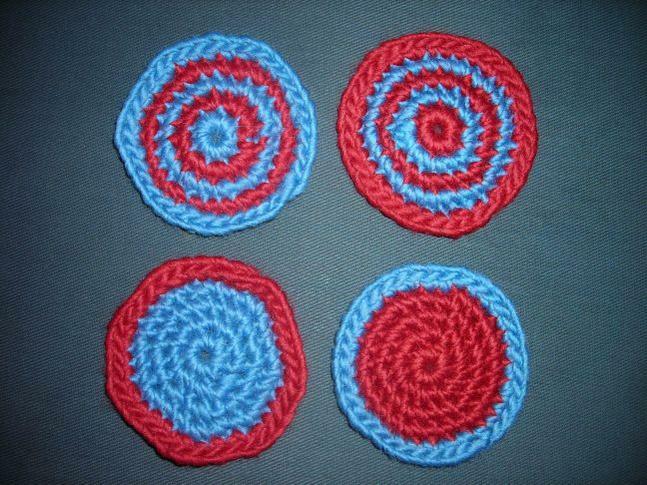 I made these with single crochet. Do we think they will felt if I wash them on hot? Or should I try the method some of you have mentioned of boiling them and using a potato masher or something to agitate? Can I salvage these little coasters? I made eight coasters and a holder, so I'd love to make this work if I can, but if not, no big loss I guess! Thank in advance for the input. If you worked them in single crochet, I really doubt they're going to felt up much. They also look somewhat tightly worked, so that will hinder the felting process too. Put one of them in the sink with the hottest water you can stand. Put on a clean rubber glove and agitate the coaster by rubbing it against the bottom of the sink. After a few minutes, if you're not noticing much difference then you probably aren't going to get a great result by felting them in the washer. When you're felting them, you don't necessarily need detergent. I felt all of my stuff without it. I just pop my items into a pillowcase or zippered laundry bag, throw in one towel, and keep running the 'wash' part of the cycle until I get the pieces where I want them. Sometimes if a piece is being particularly stubborn, I'll take it out, shock it with cold water, then return it to the washer (maybe with some boiling water thrown into the washer). If all else fails, they'll still make good coasters even if they're not felted! I never had good luck with felting in the sink. I'd give it a try in the washer with the lowest amount of HOT water and something non-linty to agitate with it. The scrubbing makes the item felt up good. I have an old pair of jeans that no longer fit and I throw them in for felting. It looks like they just went through a cold wash.
Good luck! Love your colors! And like Darah said - they will still make good coasters. When making crochet items to felt, I always use an L hook, one strand of yarn, and a hdc stitch. Item should shrink 30-40%. 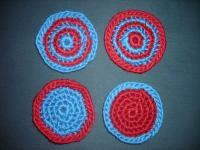 Try making a coaster up like this then felt with your previous coasters. Use hot water, add a little baking soda, throw in an old pair of jeans like BreenyBeanie said, and re-set the agitation/wash cycle at least once, maybe twice. Then compare how your coaster samples come out. You really need both heat and friction to get a nice felting result. Cold water will not do it, although if you are hand-felting, you can alternate between hot and cold, and the cold water moves things along nicely. I agree that a larger hook and looser stitches help, too. Felted objects will shrink a lot, and if they don't have room to shrink, they don't really felt as well. I do crochet pretty tightly, I always have to go up at least one hook size from what patterns say. So I will try the suggestions you have made to see if these will felt at all, but I know for next time bigger hook, looser stitches, and not single crochet.